How are you doing ? It's been a very busy week for me and I am just so happy we're almost at the weekend ! It's time for a new outfit post, featuring a Marc by Marc Jacobs olive green wool dress that I bought some time ago. I love the design of the collar, of the shoulders, and the shirt cut and the olive green color !. You can also see my crazy fold over Asos boots again, I love them more and more also because they are different, because buying them has been a matter of impulse and an act of courage, because they are the kind of shoes you either love or hate. Come state ? Questa è stata una settimana molto impegnativa per me, fino ad ora, e sono felice che siamo arrivati quasi al fine settimana ! E' tempo di un nuovo post outfit, con un abito in lana di Marc by Marc Jacobs comprato un po' di tempo fa. Mi piacciono molto il taglio del collo, delle spalle e il taglio "a camicia" di questo abitino e il suo colore verde oliva !. Potete, inoltre, rivedere i miei pazzi stivali di Asos, stivali che amo sempre più proprio perché sono diversi dal solito, perché comprarli è stata una scelta coraggiosa, in quanto sono il tipo di calzature che si amano o si odiano, senza vie di mezzo !. I decided to go for olive green opaque tights that also helped me to keep warm, and went for a light woolen top under the dress. I matched my burgundy "Too hot to handle" Marc by Marc Jacobs tote and a burgundy chain necklace from Byba bijoux. I like the result because the colors look good together. I think this dress would look good with a pair of flats (not my usual style, but they would look nice), with stiletto pumps (gotta try it), with biker boots or even UGGs. What kind of shoes would you choose ?. Ho deciso di optare per calze coprenti dello stesso colore dell'abito, verde oliva, che mi hanno anche aiutata a mantenermi al caldo, e ho indossato un top in lana leggero sotto all'abito. Ho abbinato la tote bordeaux "Too hot to handle" di Marc by Marc Jacobs ed una collana a catena sempre in bordeaux di Byba bijoux. Mi piace il risultato ottenuto per via dell'insieme dei colori. Questo abito starebbe bene anche con con un paio di ballerine (non il mio stile, ma ci starebbero bene), con un paio di pumps dal tacco a spillo (da provare), con biker boots, con gli UGG. Voi con cosa lo abbinereste ?. The highlights of my day was going to the movies to watch "Anna Karenina". I loved that movie, Keira Knightley was amazing in it and the director did a very good job. I love going to the movies so much, it relaxes me a lot. I prefer watching tv series at home, but when it comes to movies I love going out to the movies. What about you ?. Il momento migliore della mia giornata è stato andarmene al cinema a vedere "Anna Karenina". Mi è piaciuto molto, Keira Knightley è stata bravissima e il regista ha fatto un ottimo lavoro. Mi piace molto andare al cinema, mi rilassa. Preferisco stare a casa a guardare le serie tv, ma quando si tratta di film mi piace "gustarmeli" davanti al grande schermo del cinema. Che mi dite di voi ?. It's also time to announce the winner of the SunglassesShop Valentine's Vogue Giveaway ! 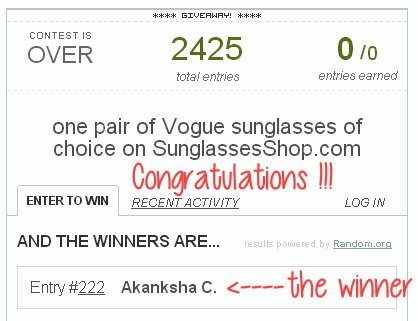 The lucky winner of a pair of Vogue sunglasses of her choice on SunglassesShop is Akanksha Chawla ! I checked and she did all the compulsory tasks and also most of the non compulsory ones ! Congrats Akanksha, I am gonna mail SunglassesShop with your details so they can contact you directly to send you your prize of choice !. Thanks to all of you for taking part in this giveaway and if you didn't win, don't be sad, cause another cool giveaway here on Fashion and Cookies is gonna start in a few days, so stay tuned !. Love the dress! So cute.. And the boots are truly original! anything MARC is necessary ! LOVE LOVE LOVE! Beautiful! Love the classic hi here . . .
love the dress and the jewelry!!! Molto bello questo abito e gli stivali sono fantastici!!! That's a seriously great dress - I really love the colour! Molto particolare l'abitino. Mi piace molto!! Io adoro gli stivali e oggi Vale ti meriti un bel 10 e lode, per ogni singolo pezzo scelto e per il risultato finale, semplicemente strepitoso! I love you so much Vale :D :D :* You made my day.. haha..
Great boots! I change a blog, if that's okay we could follow each other, if so let me know kisses. 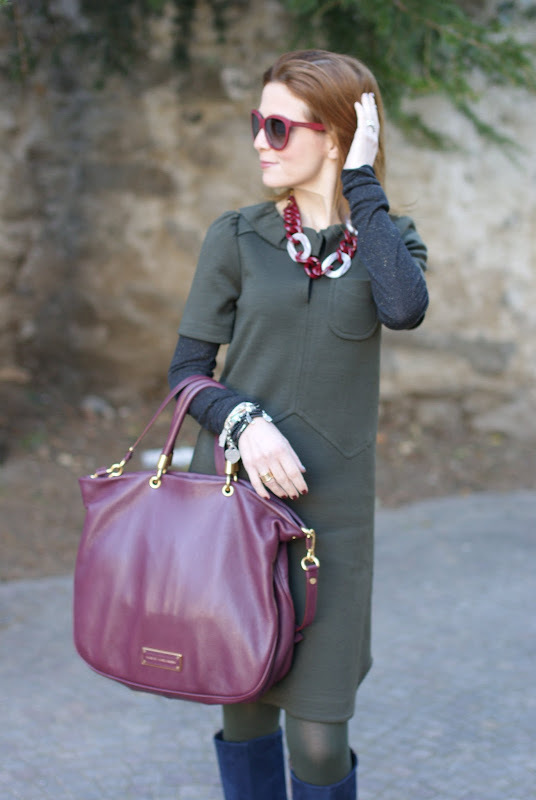 Olive is such a great color and I love it paired with the burgundy accents! 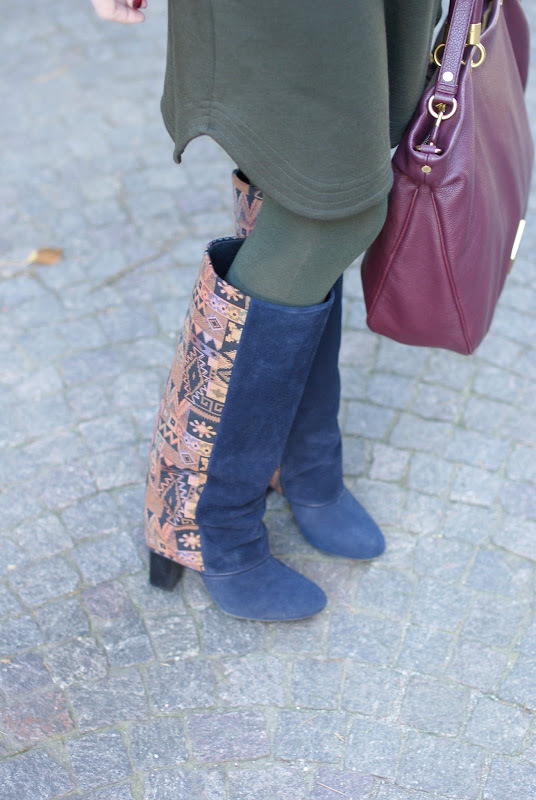 Love love love this color combo, and those boots!! they look super expensive, I can't believe they're Asos! Il verde del vestito è splendido, anche se non mi piace molto il motivo davanti... ma gli stivali sono fantasticiii!!! that is a really cute dress, but I'm really smitten with your amazing boots! oh my gosh, one of my favorite looks!! I love the olive mixed with oxblood and the cool print on the back of your boots! wow gorgeous outift, so chic! How can someone not love those boots! As for me, I adore them! I'm following your amazing blog now via bloglovin' and GFC! Love your blog too so i followed on bloglovin' and GFC. Your boots are stunning and you look beautiful! Waiting for you to follow me. I love your boots, they are so unique and special, so ethnic too! And thank you for your nice comment on my blog: I checked immediately your blog with the result: I like it because your style seems so polite and feminine. I just followed you, if you liked my blog, just follow me back! I'm following you both in facebook and in blogloving! Great post! Your bag is fantastic. Cute dress and love the boots. You styled this whole look really well. i like your boots and bag!!! love it! following you on fb, gfc, and bloglovin! Hi!Thanks for visiting my blog ;) I follow you! Hi, you have a perfect outfit. I like the all combination. But most at all, your boots. I checked you blog with the result, I like it. I'm your newest follower right now with GFC and bloglovin. Of course I would like to follow each other. Follow you via GFC, Facebook and Bloglovin. Waiting for you to do the same. wow what a wonderful dress. i love your sunnies. are they from the new collection? Great outfit, I'm loving the boots! Super cute, loving the boots too! Gli stivali son figherrimi e ti devo dire che il vestito mi piace proprio, bel colore poi con il bordeaux della borsa e della collana spicca ancor di più! Gosh, that shoes are gorgeous!I love that look! molto bella questa combinazione di colori!! il vestito è delizioso!